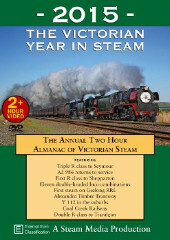 TThis superb TWO HOUR and fifteen minute DVD comprehensively covers over 50 Victorian steam operations during 2015 featuring 20 different locos. 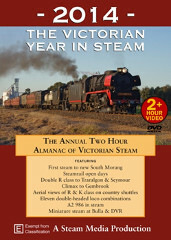 The 22nd annual DVD from Steam Media features Triple R class to Seymour, A2 986 returning to service, R & D3 parallel K & J Castlemaine departure, the first R class to Shepparton, eleven double-headed loco combinations, 20 different steam locos, Climax twilight tours, first steam on Geelong RRL, the Alexandra Timber Tramway, Y 112 in the suburbs, the Coal Creek Railway, Double R class to Traralgon, D3 639, J 549, K 153 & K 190 on the VGR, Regular and special trains at Puffing Billy, Ballarat shuttles with Y & K class and cabrides on NA, K 153, K 190, T 251. 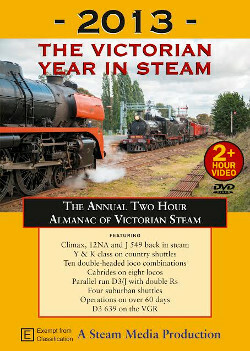 This superb TWO HOUR and fifteen minute DVD comprehensively covers over 60 Victorian steam operations during 2014 featuring 20 different locos. 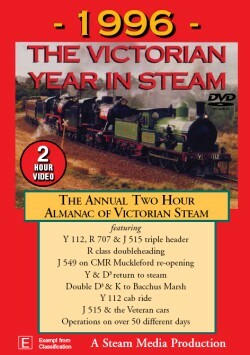 This superb TWO HOUR and fifteen minute DVD comprehensively covers over 60 Victorian steam operations during 2013 featuring 20 different locos. 2013 was a year of loco restorations and double headers. The Climax geared loco and 12NA returned to service at Puffing Billy whilst J 549 again steamed on the Victorian Goldfields Railway. Ten double-headed combinations are featured including R 707 & R 761 running parallel with D3 639 and J 549. Y 112 joined K 153 on country shuttles at Ballarat. D3 639 visited the Maldon line for the first time in 40 years. Suburban rambles ran to seven destinations. Work on A2 986 continued apace. Cabrides on no less than seven locos add interest to this production. 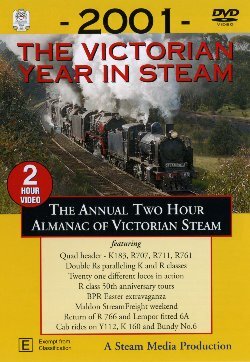 This superb TWO HOUR and fifteen minute DVD comprehensively covers over 50 Victorian steam operations during 2012 featuring 15 different locos. 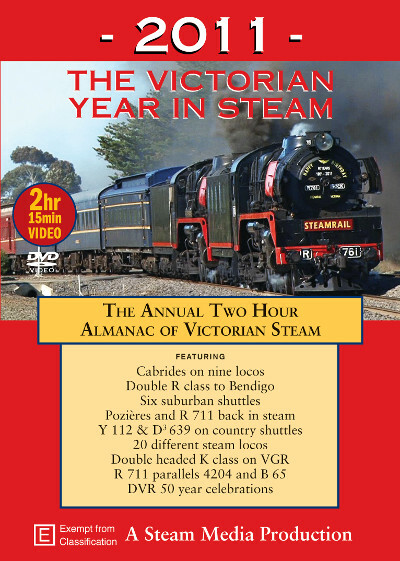 HIGHLIGHTS include: Double R class to Bendigo and Traralgon, emotive vision of 8A on an early morning mid-winter Gembrook mixed, G 42 on Last Beechy commemoration, R 711 on Bendigo 150th special, Y and K double heading and push/pull on Ballarat shuttles, K 190 at the VGR, Five suburban shuttle destinations including K and D3 to Alamein, G 42/NA double-header, Cabrides on seven locos - Poziéres, G 42, K 160, K 190, J 515, Klondyke and 14A, PBPS 50th anniversary, Steamrail Open Day, Diamond Valley Railway longest train and much more. 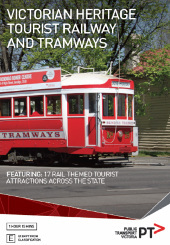 The Tourist and Heritage Division of Public Transport Victoria, under the direction of the Registrar Adrian Ponton, has funded and released a DVD promoting Victoria's Tourist Railway and Tramway attractions. 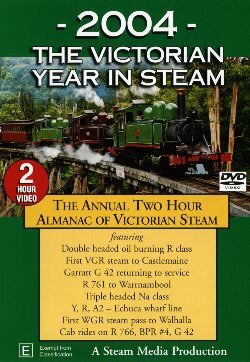 This production is designed as a cross-promotional DVD which covers Victoria's 17 Tourist Railway and Tramway operations. Each attraction has just over 4 minutes air time which shows and describes what is available at each. Whilst primarily aimed at the general public there is much information for the railway enthusiast. 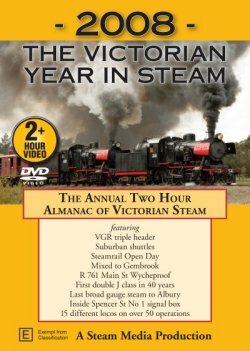 Filmed and edited by Steam Media Productions - well known to VGR members - it is a quality product with much pleasant viewing. 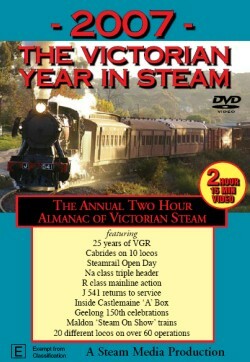 Excellent value at the price it is a great way to learn what other rail attractions are available as well as the VGR. 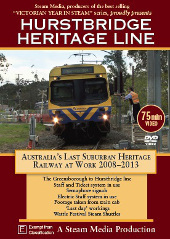 Featuring the picturesque Greensborough to Hurstbridge line, this DVD shows and explains the heritage Staff and Ticket and Electric Staff safeworking systems in regular daily use and then on their respective last days of operation. Semaphore signals, signal boxes using mechanical interlocking and ground level point indicators were worked by railwaymen and women. As such it was of immense historic significance. Between 2008 and 2013 the heritage systems were replaced by LED signals, electric motors and computer control in a major upgrade modernising the railway. Trackside and cab footage shows the picturesque line to advantage. 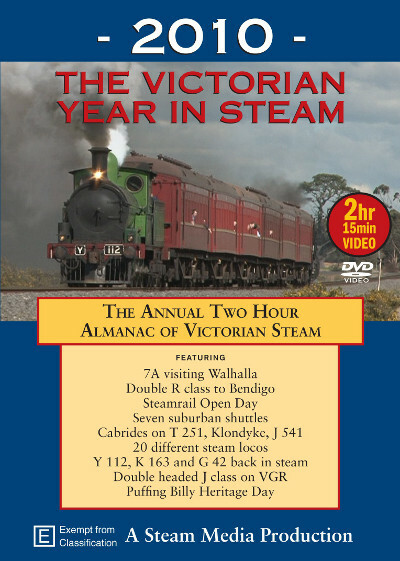 The steam hauled specials for the annual Hurstbridge Wattle Festival are also featured creating an educational and informative DVD. 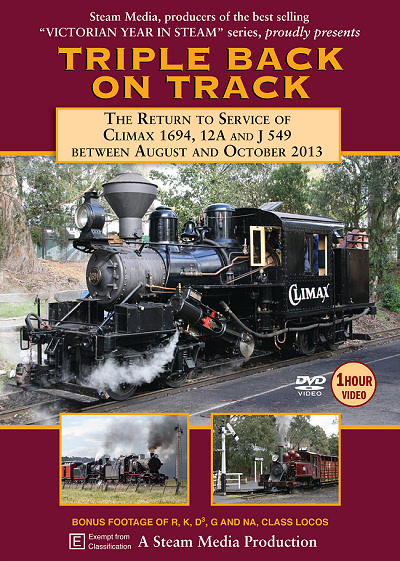 Covers the return to service of Climax 1694 and 12A at Puffing Billy and J 549 at the Victorian Goldfields Railway between August and October 2013. Features all test and first passenger trains of all three locos. Bonus footage of 8A on a wood collection train, G42 double-heading with 8A on a passenger train plus the main and branch line action of the 'Maldon Spectacular' tour featuring R 761, K 190, J515, D3 639 and J 549. Lineside and cab footage. The Gaslight Films Of Norm Wadeson: A collection of three films shot on Kodachrome Standard 8mm stock by Norm in the late 1950s & early 1960s and edited/narrated by him at that time. DEDICATED TO NORMAN E WADESON, OAM and his foresight in filming and editing these films. 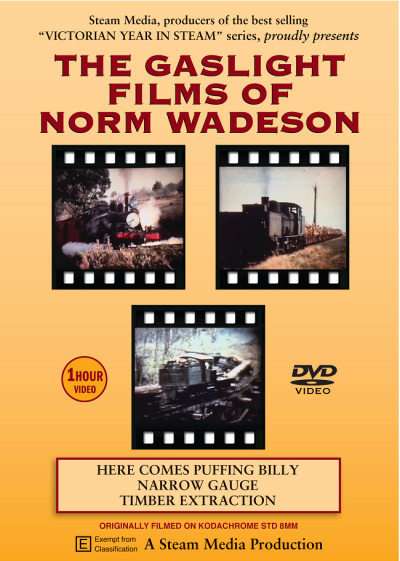 In the 1950s and 60s, stalwart of the Puffing Billy Preservation Society Norm Wadeson edited three films: 'Here Comes Puffing Billy', 'Narrow Gauge' and 'Timber Extraction' from contemporary footage he and others had shot. Shown at public meetings to gain support for the fledgling Puffing Billy Railway, the films had a wide and appreciative audience. ALL THREE FILMS CONSIST OF ABSOLUTELY UNREPEATABLE FOOTAGE. Fifty years on, Steam Media believes these superb productions deserve a new appreciative audience. 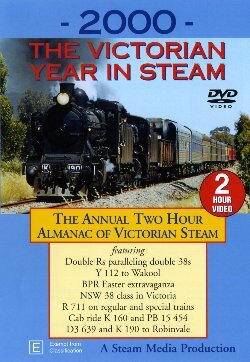 With Norm's full blessing, this DVD has been produced so that more generations may enjoy the unrepeatable historic scenes in a contemporary format. Whilst there has been some computer enhancement, the films are basically the same productions as captured on Kodachrome Standard 8mm stock almost 60 years ago. The 4:3 aspect of capture has been retained. 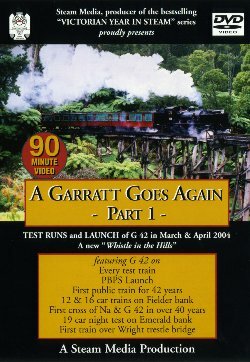 HERE COMES PUFFING BILLY - The early history of preserving Puffing Billy - 30 minutes Narrated by Norm himself, this film tells the story of the early days of the Puffing Billy Preservation Society. It covers the final runs of Puffing Billy from his original terminus at Upper Ferntree Gully when specials ran to the present terminus of Belgrave in 1958, the restoration of the line between Belgrave and Menzies Creek between 1958 and1962, rolling stock transfers and concludes with ballast, test and opening special trains in 1962. All colour. NARROW GAUGE - A run of 'The Beechy' on the Colac - Crowes line with G 42 - 10 minutes The 2' 6" gauge Crowes line in the Otway Ranges was a railfan favourite. Winding its way through picturesque country, the line was the only transport to many towns when it opened to Beech Forest in 1902. Extended to Crowes in 1911, the line faithfully served the local communities until it closed in 1963. Norm takes us on a trip during 1957 with Garratt G 42 hauling a train to Weeaproinah – the terminus at the time. All colour, with titles and accompanying background music - no narration. 2011 provided much steam action on miniature and broader gauges. The Diamond Valley Railway celebrated 50 years of operations by day and night as well as carrying its 3 millionth passenger. Double headed R class ran to Bendigo for the annual Maldon experience. Y 112 joined D3 639 on country shuttles at Geelong and Ballarat. Mainline loco K 190 visited the Maldon Tourist Railway which ran double-headed K class for a Steam On Show day. 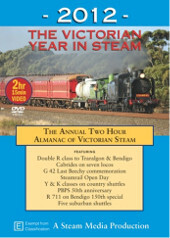 Steamrail also ran double headed Ks to Swan Hill and Echuca. Two locos were back in steam as restoration work on Pozieres was completed at the Bellarine Railway and R 711 returned to the mainline as a standard loco. Cabrides on no less than nine locos are an interesting feature of this production. DK 160, J 541 and K 190 on regular services. The Maldon Experience day including the Muckleford mixed and parallel departure of both specials from Castlemaine. 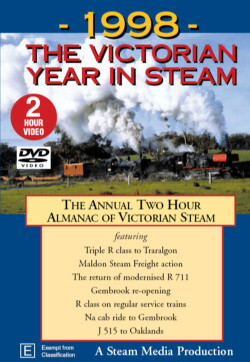 The footage on this program appears, in part, on the popular 2009 and 2010 'The Victorian Year In Steam' DVDs. As VYIS covers main and tourist line action as well as suburban shuttles there was much very watchable footage of the metro area specials which could not be included in those two hour fifteen minute productions. There were many long scenes of steam climbing steep grades and taking a fair bit of time to reach the summit which we believe should be published. Thus 'The Steam Team' has produced this DVD so you may enjoy viewing the complete story of 'Steam In The Suburbs'. 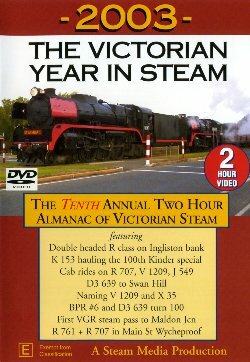 2010: Another TWO HOURs and fifteen minutes of top rail action from the Steam Media Team, comprehensively covering over 50 Victorian steam operations during 2010 featurign 20 different locos. J 541 and much more. 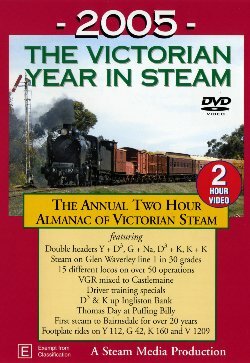 2008: The Victorian Year in Steam: This superb TWO HOUR and fifteen minute DVD comprehensively covers over 50 Victorian steam operations during 2008 featuring 15 different locos. Cabrides on K 153, Klondyke, 14A & Vulcan #4 and much more. 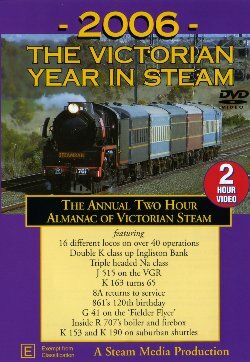 A two hour plus almanac featuring over 40 operations. Steam on the 1 in 30 Glen Waverley line. footplate rides on Y 112, G 42, K 160 and V 1209. 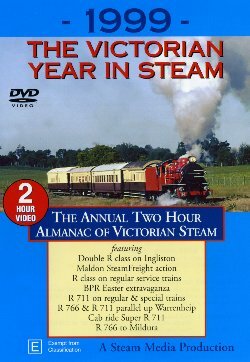 A two hour almanac featuring over fifty operations and twenty-one different locos. A two hour almanac featuring over fifty operations. Cab rides on Y112, K160 and more. Cab rides K160 and PB 15 454. A two hour almanac featuring over 50 operations. 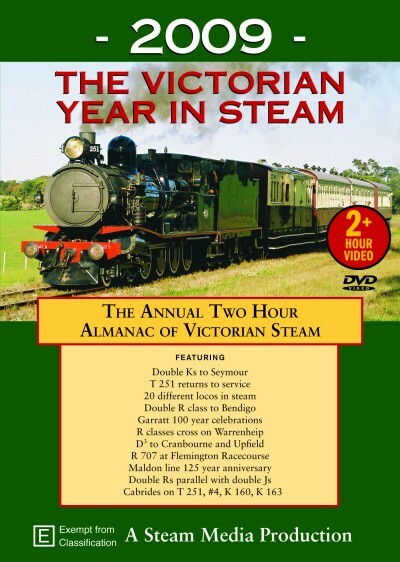 This two hour A almanac features over fifty operations and twenty-one different locos. 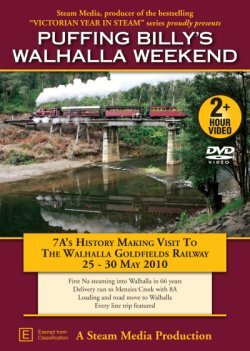 In May 2010 Victorian steam history was made as 7A returned to the Walhalla railway and hauled a series of special trains as part of Centenary celebrations for the line. Normally based at the Puffing Billy Railway in the Dandenong Ranges, 7A was taken by road to the Gippsland Hills on a short term loan to the Walhalla Goldfields Railway. Steam Media cameramen captured ALL the action associated with the visit, beginning with 7A double heading to Menzies Creek with 8A on a delivery run. Next day 7 was placed on a road low loader & transported to Walhalla. Test runs were made on the following two days and all these runs are covered. The weekend saw six special passenger trains operate in a variety of weather conditions and every train is featured at length. Entirely shot in High Definition, this DVD is THE complete record of this historic event. 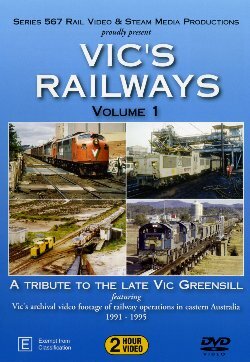 VIC'S RAILWAYS VOL 1 - A tribute to the late Vic Greensill This DVD covers Vic's travels in Victoria, New South Wales and Queensland and forms a fitting and memorable tribute to such a highly respected Engineman and railfan. The beautiful VR blue and gold. 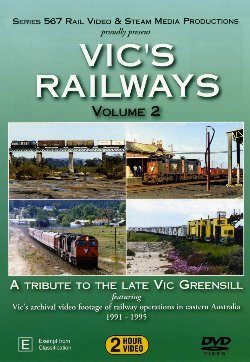 VIC'S RAILWAYS VOL 2 - A tribute to the late Vic Greensill. This is part 2 of footage taken by the late Vic Greensill in the early 1990s. 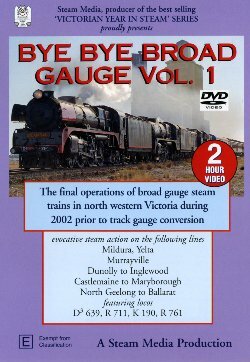 This DVD features a multitude of Victorian, New South Wales and Queensland action. ....... a multitude of Victorian and Queensland action. This superb tape, covering the Easter 2000 events in Victoria. Visual tribute to Gerald Dee (prepared by John Phillips). 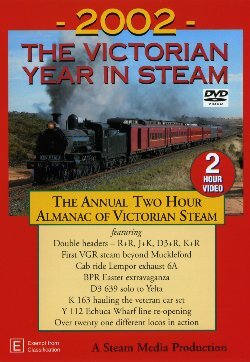 Steamrail Victoria ran a series of tours during 2002 advertised as "the final steam workings" to a variety of destinations in Victoria's northwest. This superb tape provides an excellent record of those history-making journeys. NINETY MINUTES of top steam action as narrow gauge Garratt loco G 42 triumphantly returns to service after a 42-year lay-off. and much, much more....Join the world's only operational 2' 6" gauge Garratt in scenes taken from lineside, cab, in track and parallel roads making 90 memorable minutes of 'Garratt action'. 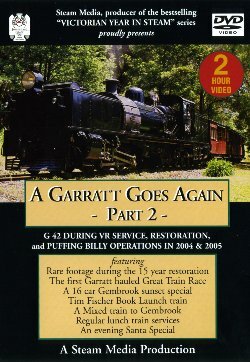 2 Hour Spectacular; A Garratt Goes Again Part 2 This companion volume to the highly acclaimed part 1 showcases G 42's restoration as well regular and special services during its first 16 months running on the Puffing Billy railway. 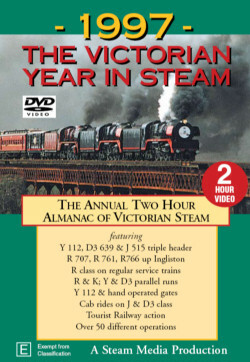 Steam Media Productions have combined with Series 567 to produce Bruce William's two very popular VHS productions as a single 90 minute DVD. 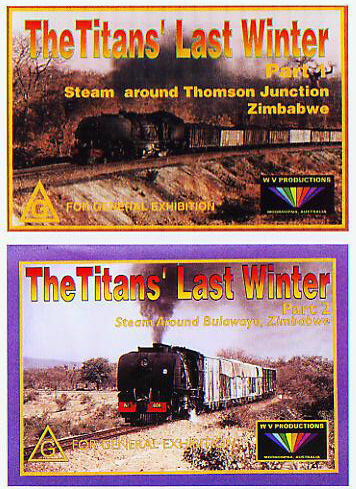 It covers the last two winters of mainline Garratt action in Zimbabwe during 1991 & 1992. The two parts run for 52 and 38 minutes respectively, giving an hour and a half of absolute history. We see Garratt operations from sunrise to sunset, from lineside and in the cab, on both passenger and goods trains - regular and special, locomotive preparation, shed scenes at Bulawayo and Thompson Junction and the infrastructure associated with steam operations. Lines covered include Bulawayo - Plumtree, Bulawayo - West Nicholson and Bulawayo - Victoria Falls including aerial shots of a Garratt on the famous bridge linking Zimbabwe and Zambia. The Wankie Colliery line is also featured where ex Rhodesian Railways 19th class 4-8-2s haul coal to the main line. Couple Bruce's very capable camera work with his skilled editing and John Batwell's informative narration and you have a marvellous memento of an era now gone forever. To purchase DVDs, simply selected your desired DVDs by clicking 'add to your cart'. If multiple copies of the same DVD are required, this can be modified upon checkout. DVDs will be mailed within 7 days of the online transaction, if you require the use of a P.O. Box, please specify this in the 2nd phase of checkout details or email it to onlinesales@vgr.com.au.